Several days ago, I mentioned the Macross Mecha Manual, an exhaustive compilation of the various mecha — variable fighters, spaceships, destroids, etc. — that appear in the Macross franchise of TV shows, movies, OVAs, and games. The Manual hit a real sweet spot for me because I’ve always enjoyed the incredible amount of thought and attention to detail in Macross​’s designs. As a kid, I was obsessed with fighter jets. I’d constantly check out library books about aircraft like the F-15 and F-16; I’d pore over their technical specs and stare endlessly at the photographs. The moment I first watched Robotech (the westernized version of Macross), the airplane geek in me was instantly drawn to the detailed mecha designs, which looked like they could exist in the real world. This was due to Macross creator Shōji Kawamori, who has designed many of Macross​’s vehicles (including nearly all of its variable fighters). Even at their most fanciful, his designs still draw inspiration from a lot of real world aircraft history and design, which makes things like the Valkyrie’s ​“GERWALK” mode seem plausible. To this day, whenever a new Macross title’s announced, I first check out the mecha designs. Forget about characters and storyline, I want to see the vehicles. So with that in mind, I’ve compiled a list of my favorite mecha designs from throughout the Macross universe, based on a combination of nostalgia, aesthetics, and overall coolness. I’m not going to try and argue which one could take out the most Zentraedi or anything like that, but there will be some definite nerding out, so consider yourself warned. The VF-1 Valkyrie design has popped up in several non-Macross places, too. It was the basis for the ​“Generation 1” design of Jetfire, my personal favorite Transformer (and one of the coolest Transformer toys of all time), though legal issues eventually forced a complete redesign. Kawamori’s Valkyrie design, plus several other mecha designs, were also used in early editions of the BattleTech role-playing game. FASA, the creators of BattleTech, would later discover they didn’t have the legal rights to use Kawamori’s designs, and removed them from subsequent BattleTech editions. What’s more, Macross Plus​’s plot was partially inspired by a major event in modern military aviation history: the ​“Advanced Tactical Fighter” program. The ATF program was intended to develop the Air Force’s next air superiority fighter, and ultimately led to the F-22 Raptor. In Macross Plus, the two fighters undergoing evaluation as part of ​“Project Super Nova” (as it’s called) are the YF-19 and the YF-21 (which also had a pretty cool design). Ultimately, the YF-19 — spoiler alert! — wins the competition and becomes one of the primary Macross mecha designs, appearing in later Macross series like Macross 7 and Macross Delta. When coming up with new Valkyrie designs for 2008’s Macross Frontier, Kawamori apparently wanted to move away from the stealth-influenced designs that have come to dominate real-world fighter design (e.g., the F-22 Raptor, the F-35 Lightning II). As a result, the VF-25’s design clearly hearkens back to the original VF-1 design, albeit in a much sleeker and more streamlined form. In fact, it’s so sleek and streamlined that it looks a little grotesque in places: see the head design of its Battroid mode, as well as some of its variants, like the over-the-top ​“Armored Messiah” variant. 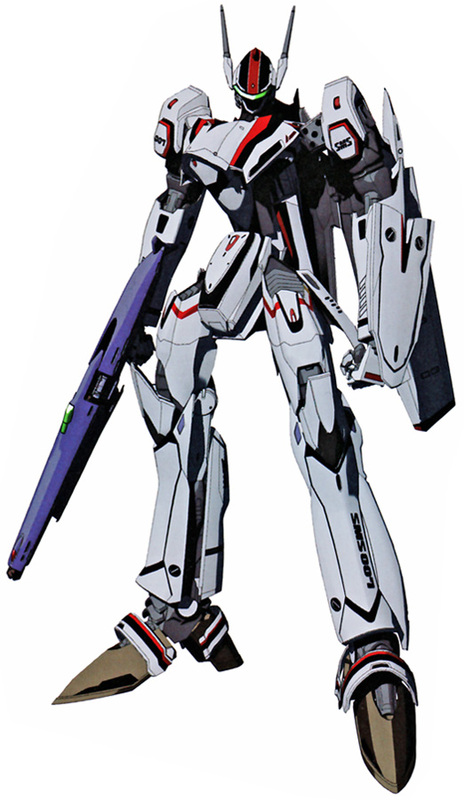 But in its fighter mode, the standard VF-25 Messiah is a real beauty that looks fast just standing still. Ah, Macross II, the Macross franchise’s red-headed stepchild. Historically, the two companies primarily behind Macross​’s development have been Studio Nue (the original creators) and Big West Advertising (which sponsored its development). By the early ​‘90s, though, Studio Nue didn’t want to make any more Macross, so Big West went and created Macross II — which, for whatever reason, was a continuation of 1984’s Macross: Do You Remember Love?, an alternate retelling of the original Macross storyline. When Studio Nue got back into the Macross game, they ignored Macross II and created Macross Plus, which continued the timeline of the original Macross television series. As a result, Macross II (and its related video games) are non-canonical, and many fans — myself included — consider it an inferior work. And yet… it does have some cool-looking mecha, though Kawamori, who works for Studio Nue, was not involved in their design. Designed by Kazumi Fujita and Koichi Ohata, the VF-2SS looks bulkier than other Valkyrie designs at first glance — probably because it’s designed primarily for space combat — but its smooth organic-ness keeps it looking sleek and fast. I’m generally not a fan of the armored Valkyrie variants but I do like the VF-2SS’s armored variant, which has the clever addition of autonomous drones that fly alongside the VF-2SS and add to its overall tactical capabilities. There’s more to Macross than variable fighters. For ground combat, the Macross universe includes Destroids, which are essentially walking tanks — and they don’t come more massive and ridiculously overpowered than the ​“Monster” (which was designed by Miyatake Kazutaka). I mean just look at this thing. Weighing in at 300 tons, it’s the largest ground vehicle in the Macross universe, with 4 massive artillery cannons around its head and triple-barreled missile launchers for arms. Destroids may not get as much fame and glory as Valkyries and their hotshot pilots, but I’m pretty sure that many a Zentraedi soiled their spacesuits when they saw this beast on the horizon. The Zentraedi mecha in the original Macross look a little goofy, like a cross between the Star Wars AT-ST and an ostrich egg. At the same time, there’s an oddness and alienness to them that makes them rather creepy. It’s this blend that I like most about this particular Kawamori design. The Glaug battlepod was used by Zentraedi commanders, and as such, is more heavily armed and armored than the standard Esbeliben Reguld battle pod. Most notable is the electron beam cannon located above its ​“head” and its arm cannons. The Glaug was another Macross design that appeared in early BattleTech editions; it was the inspiration for the Marauder and Marauder II. You’d think that if I was going to spotlight any Macross spacecraft, it’d be the Super Dimension Fortress, or SDF-1. After all, it’s in the show title (and the header of this article). True, the SDF-1 is pretty iconic and awesome-looking, especially when it transforms into its giant ​“Attack” mode (which uses an aircraft carrier for one of its arms) or fires its powerful bow cannon. However, the Zentraedi ship designs immediately fascinated me when I first saw them in Robotech. No doubt that was due to the fact that, at the time, they looked unlike any other spaceships I’d seen. Up until then, I was mostly familiar with the vessels of Star Trek and Star Wars, but the organic-looking Zentraedi designs truly looked alien to my young eyes. The Nupetiet-Vergnitzs class battleship is the pinnacle of Zentraedi ship design; with a length of 4 kilometers, it dwarfs the SDF-1 and is one of the largest vessels in all of the Macross titles. And though it boasts a mind-boggling armament that’s useful for both space combat and orbital bombardment, there’s an oddly graceful beauty to its curves that belies its massive power.